Cisitalia was an Italian sports and racing car brand. The name "Cisitalia" derives from "Compagnia Industriale Sportiva Italia", a business conglomerate founded in Turin in 1946 and controlled by the wealthy industrialist and sportsman Piero Dusio. The Cisitalia 202 GT of 1946 is well known in the world as a "rolling sculpture"
The Cisitalia 1100's, developed by Abarth at the via Trecate works in Turin, took the first three places in the 1949 Senigallia race. Cisitalia was born from the idea of industrial Piero Dusio, in Turin, 1945. Being himself an excellent pilot, Piero thought to build a limited number of light single-seaters with the idea of continuing mass production later. With the support of engineers Dante Giacosa and Giovanni Savonuzzi, today famous worldwide, Piero built a series of fast single-seaters of 1100 cc tubular chassis. Cisitalia´s single-seaters debut was on September 3rd of 1946, in the Valentino circuit. It was a total victory. The little "Cisi" wins despite competing with larger displacement cars. The domain remains in the formula 2, with Piero Taruffi laureate, Italian champion in 1949, allowing him to probe himself towards the largest drivers of the time. Following the same concept, Piero decided to continue with the two-seater sport. 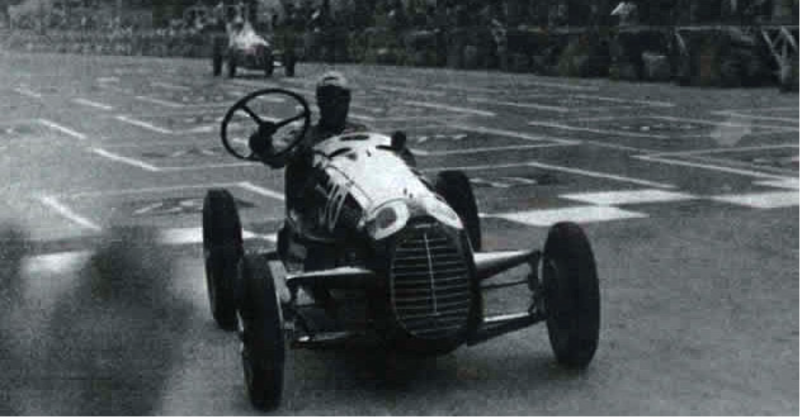 The great driver Tazio Nuvolari takes moral victory at the wheel of a Cisitalia 202 SMM, later named Spyder Nuvolari, in the legendary Mille Migliain 1947.He comes second, despite a mechanical failure that stops and delays him twenty minutes, behind a great Alfa Romeo 2900 8-cylinder, driven by the pilot Biondetti. Seven Cisitalias participate in this race.Small "Cisi" of only 1100cc ranked second, third and absolute fourth. The wonderful Cisitalia 202 coupé is born on the victory of these events from wizard´s hands Pininfarina. Through theperfection of his design, the final product achieves incrediblerecognition. The Cisitalia 202 coupé was shown at the Museum of Modern Art in New York for 40 years, beingdefined as a "moving sculpture". The project that followed this model was to build a Grand Prix car, whoseengine was developed by Ferdinand Porsche. An advanced machine arises: 1500cc engine compressor, back box, tubular chassis 400 hp, and speed of 300km/h. In November 1946, Commendatore Piero Dusio, general manager and co-owner of the Cisitalia firm, decided to build a Grand Prix car in his premises and entrust the projects to Porsche. The fact that he himself built the sports car in his factory can be considered a post-War phenomenon. He came up with the idea of a Grand Prix car alter producing the Cisitalia 1100, a sports single-seater, without the collaboration of Porsche. The car became renowed for its victories all over Europe and America, not only in its own class but in many cases also winning the qualifying runs against much larger machines. Between 1946 and 1949 almost all the great drivers tried the small racing Cisitalia: Ascari, Taruffi, Von Stuck, Bonetto, Nuvolari, Lurani. In terms of anecdotes, we can recall the 1947 Mille Miglia in which Nuvolari, driving the Cisitalia Sport, was first overall and was defeated at the last straight straight stretch by Biondetti in a blown Alfa 2.9. Using Fiat parts as a base Dante Giacosa designed the D46 which made its successful debut in 1946. Giacosa had a vast knowledge of Fiat bits and pieces as he had designed the legendary 500 Fiat Topolino before WW II. The engine and suspension were directly derived from the small Fiat but extensively modified for racing. The engine received dry sump lubrication and further tweaks considerably increased the power output to 60-70 bhp. With a space frame chassis and weighing under 400 kg (880 lb) the available power was more than enough for competitive performance. Dusio's dream of a one model series came to nothing, but instead his D46s started to dominate the voiturette series. Highly talented drivers like Tazio Nuvolari piloted the D46 to multiple successes against more advanced but older racing cars. This successes led to a much more ambitious single seater project that would prove too much for the small company. Ferdinand Porsche was commissioned to design and construct a full Grand Prix car which led to the innovative but complex Cisitalia 360. With a mid engined layout and four wheel drive the Type 360 was far too expensive for Dusio to support and the attempt essentially killed any further racing cars. Dusio commissioned several automobiles from Europe's leading designers. He provided Pinin Farina with the chassis, on which an aluminum body was handcrafted. When first presented to the public at the Villa d'Este Gold Cup show in Como, Italy, and at the 1947 Paris Motor Show, the two-seat 202GT was a resounding success. The 202 was an aesthetic and technical achievement that transformed postwar automobile body design. The Pinin Farina design was honored by New York's Museum of Modern Art in 1951. In the MOMA's first exhibit on automotive design, called "Eight Automobiles", the Cisitalia was displayed with seven other cars (1930 Mercedes-Benz SS tourer, 1939 Bentley saloon with coachwork by James Young, 1939 Talbot-Lago Figoni teardrop coupé, 1951 Willys Jeep, 1937 Cord 812 Custom Beverly Sedan, 1948 MG TC, and the 1941 Lincoln Continental coupe). It is still part of the MoMA permanent collection. It was not, however, a commercial success; because it was coachbuilt, it was expensive, and only 170 were produced between 1947 and 1952. Most cars were coachbuilt by Pinin Farina with some by Vignale and Stabilimenti Farina. Building on aerodynamic studies developed for racing cars, the Cisitalia offers one of the most accomplished examples of coachwork conceived as a single shell. The hood, body, fenders, and headlights are integral to the continuously flowing surface, rather than added on. Before the Cisitalia, the prevailing approach followed by automobile designers when defining a volume and shaping the shell was to treat each part of the body as a separate, distinct element—a box to house the passengers, another for the motor, and headlights as appendages. In the Cisitalia, there are no sharp edges. Swellings and depressions maintain the overall flow and unity, creating a sense of speed. The 202 is featured in the 2011 video game L.A. Noire by Rockstar Games and Team Bondi as a secret car called the Cisitalia Coupe. Since the 202 never made large scale production and all the cars were handmade, the small talented group at Cisitalia, including Carlo Abarth, Dante Giacosa and Giovanni Savonuzzi, made several variants of the 202. Of the more important versions, the SMM Nuvolari Spider was built and named after a class victory at the 1947 Mille Miglia. It is easily identified by its large rear fins, twin windscreens and usual Italian blood red paint scheme. Partly due to expensive construction of the mid-engine, four wheel drive formula one car, designed by Ferdinand Porsche. In total, around 200 cars were made which made a large impact on the later marques, including Abarth's later range of cars. For the upcoming 1947 season, Giovanni Savonuzzi, who had designed most of the 202, sketched a coupe body for Cisitalia's competition car. The design was executed by Stabilimenti Farina upon both chassis #101 and #102. After two coupes had been finished, a spider version, Called the SMM for Spider Mille Miglia, was completed which would adorn all subsequent competition cars bearing the MM designation. At the 1947 Mille Miglia, the Cistitalia spider really proved itself by leading most of the race in capable hands of Tazio Nuvolari. Despite having competition with engines three times larger, Nuvolari held back the competition until troubles ensued in the rain. In the end, the Cistitalia took second overall and first in class. For this epic effort, subsequent competition spiders were known as 202 SMM Nuvolaris. Since the 202 SMM received much attention at the Mille Miglia, Stabilimenti Farina continued production of the design for several customers. 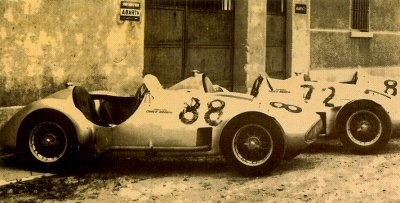 In total around 20 cars were made very similar to Nuvolari's winning car. Some images from this page originally appear in "Abarth History - The Sign Of The Scorpion"